It's not typical for a girl to share this bit of information, but today I am sharing it for the greater good... I dye my hair. My natural color is strawberry blonde (almost golden blonde), and currently it's a reddish brown. I dye my hair, because my natural color tends to wash me out in the harsh, sunless winter months. Unless you are dying your hair an unnatural color like pink or blue, you DON'T have to use a specific color preserving shampoo. But, you DO need to use a sulfate free shampoo. I learned this one from my stylist, who had purple hair. A few of my favorites are Living Proof PhD, Pureology, and Amika. On the subject of shampoo, DON'T use any type of clarifying shampoo. The ingredients are BAD for color. DO use dry shampoo & conditioner and DON'T wash too often. Washing your hair will speed up the fade process. And when you do wash, DO shampoo and condition using cool or lukewarm water. Hot water will strip your color. After washing and conditioning, DO use a leave in conditioner like Pureology Colour Fanatic or Living Proof PhD Night Cap Overnight Protector. DO use a color-protecting mask a few times a week, especially if you have well water. I like Pureology Colour Fanatic Instant Deep Conditioning Mask and Beauty Protector Protect and Treat Hair Mask. DON'T use too much heat- it will fade your color, but if you must heat style, DO use a heat protector. DO shield your hair from UV rays, even in the winter. UV rays will aid in the fading process, so when choosing styling products, make sure that it's formulated with UV-Protection and designed for color-treated hair. DO get regular trims. Getting regular trims helps with hair growth, and bonus, you get more time with a stylist and a blowout! DO use a gloss between dye jobs. Getting a demi-permanent dye glossed over your hair, will help with the damage that regular permanent dying does. Plus, demi dyes are usually cheaper than the permanent ones. DO take this color quiz from Madison Reed and find your perfect hair color. 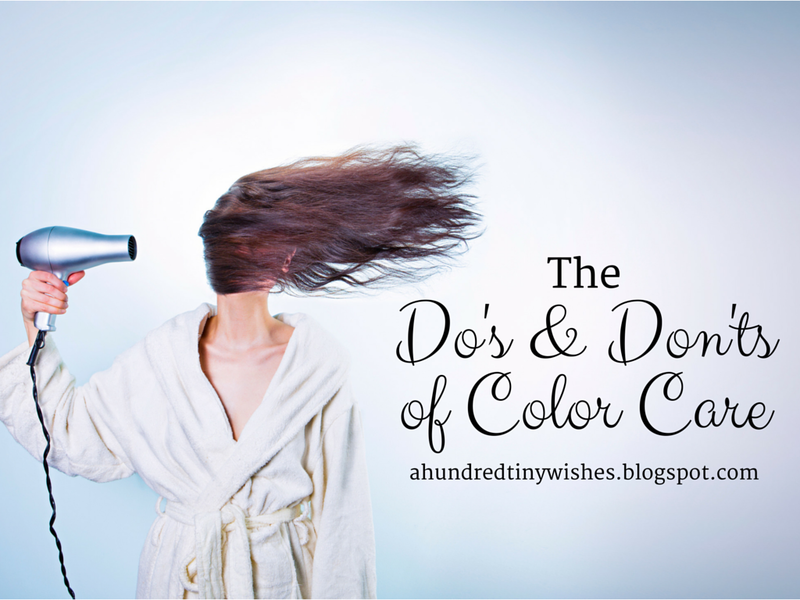 For more DOs and DON'Ts, check out my post on 25 beauty tips & tricks.